WORTHING Football Club joint boss Gary Elphick says he would happily start the season tomorrow with the squad Rebels have assembled. Tony Nwachukwu joined from Horsham last Wednesday and former Rebel Steve Metcalf also returned to the club on the same day. Midfielder Brannon O’Neill has also committed his future to the club by signing a one-year deal but three of last season’s squad will not be returning. Curtis Gayler has a two-week trial at League One Swindon and also has interest from a number of other Sussex clubs, so will not be back at Rebels next season. Defender Jack Cook has a one-year internship in Holland, so will not return next season – but Elphick hopes he will be back for the following season – and winger Tom Lawley will also not be returning to Woodside Road. 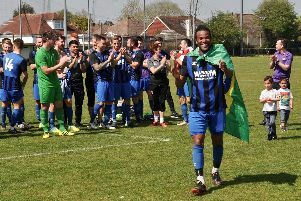 Elphick was delighted to land Nwachukwu, who scored 24 goals for Horsham last season, and Metcalf and to keep O’Neill and said: “Tony and Steve are two fantastic additions to any team. “Tony will add the fireworks, he’s an exciting player and the fans will love him. To score the amount of goals he did last season for a team who were relegated shows his quality. “Steve is a vastly experienced defender and will be another senior member of the squad to help the young players and bring them through. “Straight away, when Steve and Tony walk into the dressing room, they’ll give that extra percentage of confidence to all the other players. “Brannon is a vital member of the squad as well. Although he’s only 25, he’s a senior member of our squad and is a leader. He sets the tempo at training and it’s fantastic that he’s committed his future to the club. Metcalf is delighted to be back at Worthing after he spent the last two seasons with Peacehaven. He said: “It’s brilliant to be back and I’m thoroughly excited by the prospect. Being a local lad and seeing everything that has been going on, with George Dowell and the new pitch, it’s really exciting. “I live 100 yards from the ground so for me, personally, it’s a perfect fit. I don’t think I would have left two years ago if certain things hadn’t happened at the time, so it was an easy decision to come back. “I’d always kept an eye on what was happening at the club and popped in to watch them when I could. On the departures of Gayler, Lawley and Cook, Elphick said: “Curtis didn’t sign the contract he was offered and has an opportunity with Swindon. A few other clubs higher up in Sussex are also looking at him, so we didn’t want to stand in his way. “We couldn’t tie him down, so wish him all the best as we need to know our numbers and get everyone committed to the club. Tony can also play right wing and we’ve got other options there as well. “It was a joint decision for Tom not to come back but we again wish him all the best.